1. 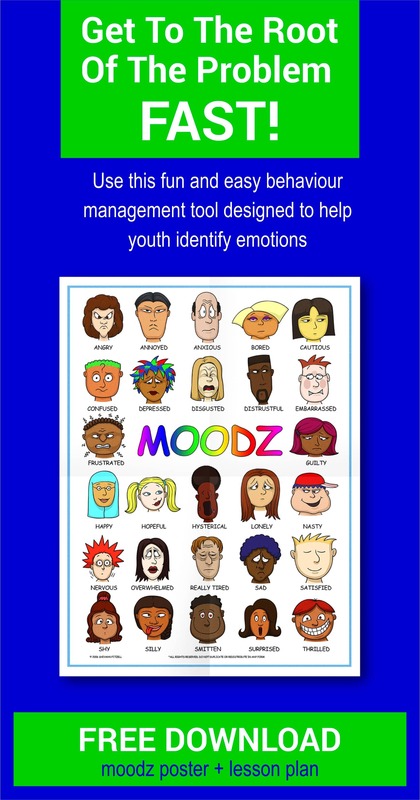 Give youth a vocabulary for their emotions – Use our Moodz poster to help kids identify their emotions and name their feelings. Students may not have the words for what they are feeling, but they may recognize the emotion in the expression on a child’s face. Ask children to point to the face on the poster that best expresses their own feelings and then teaches them the label for that feeling. 2. Use picture books as a tool for exploring emotions – Choose books that illustrate the facial expressions of the characters in the story. For older students, choose picture books with themes appropriate to young, as well as adult, readers. Read the book to students, noting facial expressions, emotions, conflicts, actions, and reactions to the characters and outcomes. 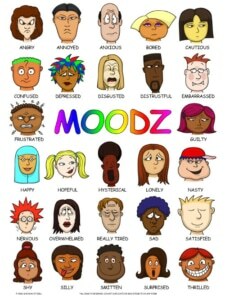 Then, teach students the vocabulary for the characters’ emotions. 3. Play emotional charades! – Write many different emotions down on slips of paper and put them in a bag or hat. Have students take turns picking an emotion to portray and acting out that feeling, without speaking, in front of the class. The rest of the class must then guess which emotion is being portrayed. 4. Tell them what they are feeling. It is very important to acknowledge a youth’s feelings and give them a vocabulary for those feelings. This technique is just as valid for secondary students as young children. Help students connect how they are feeling, and consequently behaving, with labels for their emotions. For example, when students are angry because they are not getting their way, say, “I can see that you are feeling frustrated right now.” Avoid using derivatives of the word angry. Angry is overused. By labeling their emotions for them, teachers and parents can help youth learn to accurately label their emotions themselves. 5. 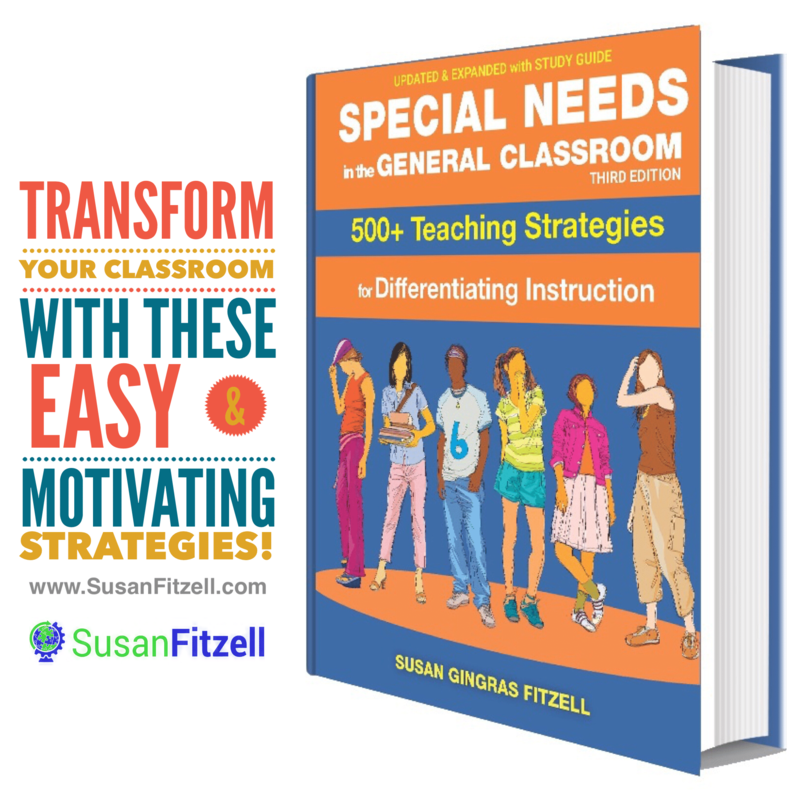 Role-play with students – Using situations that occur in the classroom, have two students at a time role-play how they would act in a situation in front of the class. For example, have one student act as a bully while student acts as the victim. After each role-play scenario, have the whole class talk about how they might feel if they found themselves in a similar situation. 6. Teach students to be aware of their body language and the message it portrays. After students role-play a scenario, ask the audience to discuss what emotions and messages the actors’ body language portrayed. Most young people are completely unaware of what kind of message their body language is projecting By pointing it out and labeling the emotion that it portrays, students can become more aware and more in control of their body language and will learn more about labeling emotions in the process. 7. Help students understand that anger is a secondary emotion – Before a person feels angry, they experience another, often unnoticed, primary emotion, such as sadness, jealousy, surprise, or embarrassment. When a student says they are angry, help them to identify and label the primary emotion behind that anger to better understand and deal with their emotions. 8. Teach empathy – When students are involved in a conflict, help them to understand how the other person feels. Ask them how they would feel if they were in the other’s shoes. By helping students to identify and understand not only their own emotions but also the emotions of others, teachers and parents can help young people to more successfully label and understand emotions in general. 9. Help students connect their emotions and their body language – Ask them to recall a situation that made them feel happy, sad, angry or any other emotion. Have students draw a picture of a facial expression to match the given emotion and then share the pictures with the class. Seeing how students’ pictures differ will help to determine how each student views each emotion. 12. To help students understand situations that cause them to experience a specific emotion, ask students to think about which emotions they most commonly feel and what makes them feel that way. If students realize that the same situation always makes them feel sad or hurt, they will likely avoid that situation or learn a new way to deal with it. This will help students develop better ways to deal with conflicts and emotions. Would you like to reprint this article, or an article like it, in your newsletter or journal? CLICK HERE to visit the articles page.